Abbotsford has a reputation for being Canada’s most charitable city. In this town of about 135,000 people, about an hour’s drive from Vancouver, there is a tattoo parlor called the Golden Republic Tattoo in an office building next door to a Malaysian restaurant where Steve Wiebe, one of the world’s hottest tattoo artists, resides. 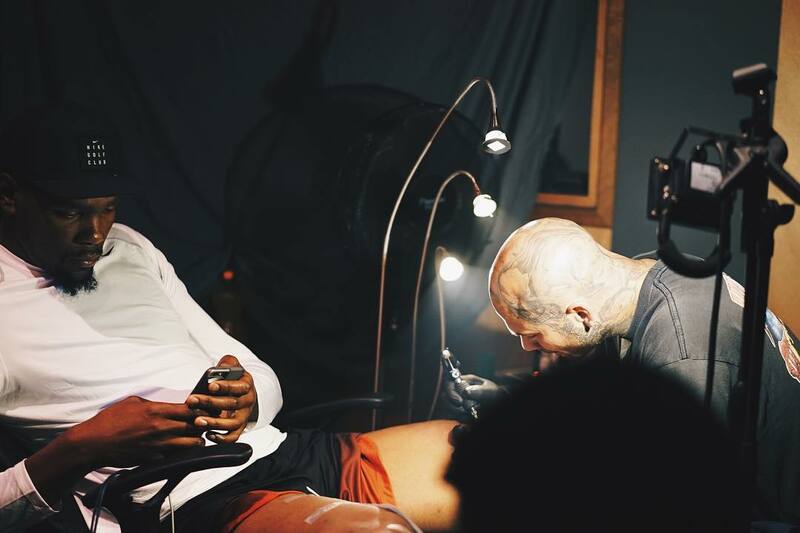 Tattooed himself from head to toe, Wiebe has done a combined 10 tattoos on NBA stars Kevin Durant and DeAndre Jordan since the summer and also has several other NBA players and the rapper Future on his growing celebrity client list. “He’s really like an artist. Some people will say, ‘Let’s put the tat that you say on you.’ He wants to feel it. Placement. What’s going on. What picture to go with. He’s good, man,” he said. Wiebe is a huge basketball fan who loved going to Vancouver Grizzlies games for $3 as a kid to watch Mike Bibby and Shareef Abdur-Rahim before the franchise moved to Memphis in 2001. He naturally loves hockey and was very good at drawing during his youth, too. He played basketball for a year in junior college before deciding to go into the real world to become a kitchen cabinet-maker. Wiebe is also a huge fan of Hall of Famer Allen Iverson, who “went against the grain” and had outstanding tattoos. In 2008, Weibe decided to pursue a career as a tattoo artist in large part because of Iverson. Steve Wiebe inks a new tattoo on recording artist Future while in Jamaica back in June of 2016. After giving up on being a kitchen cabinet-maker in 2008, Wiebe got a job helping out at a tattoo shop with a lot of tough guys “who liked dark, hard-core s—” as clients in Abbotsford. It became his passion, but he was more into drawing beautiful roses than skulls, to those Canadian tough guys’ ire. “Once I got tatted, I thought that this was something I could probably do because I have an art background. And then I was fascinated and I saw how some of the artists were living. You’re pretty much a pirate. You come and go as you please and make cash every day. It was appealing to me,” Wiebe said. He saved money to go to Los Angeles to get tattoos from some of the best tattoo artists about four to five times per year when he first got into it. He eyeballed their every move to “gain knowledge” of some of the top tricks of the trade. He took that knowledge home to bring his own style of tattooing, which was foreign to Canadians, who favor fancy script writing and roses. “I was taking trips by myself after saving $1,500. I would take a flight to L.A., go stay in some wack hotel that’s cheap, eat dollar burgers and run to get tatted by who I thought were the best artists in the world at this shop called Ink Slingers,” Wiebe said. Shortly after, Wiebe earned a reputation for being elite at tattooing portraits. His first portrait tattoo was of a superhero on a former cabinet store co-worker. The first celebrity who became familiar with Wiebe’s work was current Los Angeles Clippers forward Dorrell Wright. Wright first noticed Weibe’s work on his Instagram account in 2014 while playing for the Portland Trail Blazers. After falling love with Wiebe’s style, Wright sent him a direct message on Instagram to contact him for a potential job. Wiebe did Wright’s first tattoos at the end of the 2014-15 NBA season. “I got a rose on my chest and a King Tut on my thigh that I still need to finish,” Wright told The Undefeated. “He got kidnapped by K.D. and DeAndre this past summer, so I wasn’t able to finish. He just has to finish one more half of the King Tut. I couldn’t take the pain no more the first time. I had to tap out. He is one of those dudes I can wait for. I’m in no rush. You can’t really see it either. Wiebe has also done tattoos for NBA free agent forward Josh Smith and New York Knicks guard Brandon Jennings. Smith first noticed an Audrey Hepburn tattoo that Wiebe did for someone else. Jordan became familiar after asking Smith about some of his tattoos and followed Wiebe on Instagram. After Jordan and Smith became teammates on the Clippers last season, Smith finally put Jordan in touch with Wiebe. Meanwhile, Durant was looking for a tattoo artist, and early this year a friend recommended that he look at Weibe’s Instagram page. Durant was “blown away” by Wiebe’s work and particularly liked the musicians he did, such as Andre 3000. After text message correspondence, Durant reached out to Wiebe and they had a consultation meeting in Las Vegas in July to get the ink rolling later. The first tattoo Wiebe did for the 2014 NBA Most Valuable Player was of the late rapper Tupac Shakur with a Wu-Tang Clan logo underneath. After the Rio de Janeiro Games, Durant added a Wiebe tattoo on his thigh of late singer Rick James. Wiebe said that Durant was interested in getting a collection of tattoos of his favorite musicians and had put a lot of thought into it. Durant explained the meaning of the music-connected tattoos. “Wu-Tang exemplified a group of kids coming from poverty that joined together and changed the culture of hip-hop,” Durant said. “They were inspiring to me. The logo is just so dope that I just wanted to get it. And what they stood for, how tight they were, it spoke volumes to me. “Tupac, at the age of 22, 23, talking the way he talked, was profound and impactful to people in our generation today. It was just timeless interviews and timeless moments that he had that still resonates with us today. That was definitely inspiring to me. “Probably the first time I really listened to music was Rick James with my grandma when I was 7 or 8 years old. And every time I hear a Rick James song, it just takes me back to my childhood when things were easy and good. He inspired me. Steve Wiebe works on a tattoo for Kevin Durant of the Golden State Warriors in September of 2016. Jordan was walking around the Las Vegas casino that the USA Olympic basketball team was staying in during training camp in late July when he bumped into Wiebe, who was gambling at the Wynn Hotel. He consulted with Wiebe while he was there to set up work on the first of several tattoos. Wiebe has done seven tattoos on Jordan, whom he affectionately called a “hippie who likes getting stuff that makes him happy.” But perhaps the most daring tattoo he’s done was a “peace” tattoo on Jordan’s knee on a private jet in the air in Europe. Durant took pictures with Wiebe and his “very supportive” wife, Vanessa, and four kids after the Warriors’ preseason opener in Vancouver Saturday. The 29-year-old went on a trip with Durant and Jordan to Greece and the Netherlands after the Rio de Janeiro Games. Wiebe also attended one of the rapper Future’s family events in Jamaica and spent a lot of time with him this summer. Wiebe recently hung out with Jordan, has attended one of Wright’s charity events in Los Angeles and one of Smith’s son’s Little League baseball games. Wiebe puts his tattoo equipment in an old Jordan Brand shoebox that is taped up instead of a fancy tattoo bag. Durant drew inspiration from watching Wiebe keep it simple and his attention to detail. “He has a Jordan box wrapped up in tape,” Durant said. “It wasn’t this big show when he came in there. He’s so good that you expected all the bells and whistles and the stands. He just came in there with a shoebox full of his gear and his equipment. He unfolded the massage table and just went to work. Wiebe appreciates that the NBA star respects his work as much as Wiebe respects Durant’s athleticism. 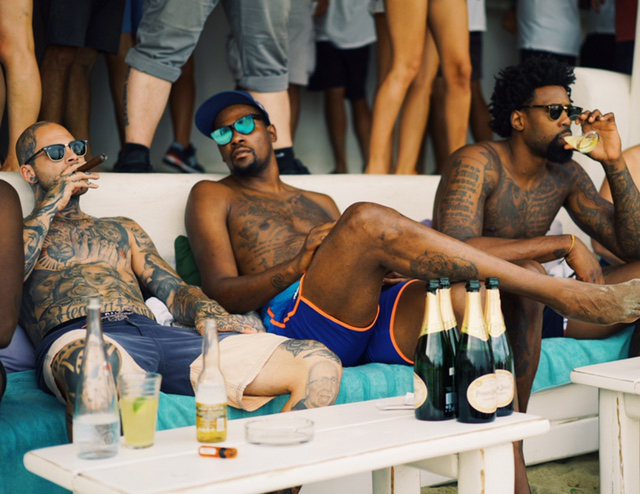 Durant, Jordan and Wright plan on getting more work done from Weibe during the offseason since it is hard physically to get tattoos during the season. NBA All-Stars LaMarcus Aldridge and Kyrie Irving are expected to be future clients. But with all due respect to his NBA friends, Future and the other celebrities he has tattooed, Wiebe’s biggest dream is to put a tattoo on Iverson. “When people say, who do you want to tat of anybody in the world, that’s the name that comes up,” Wiebe said. “But I know the older you get, the more that s— hurts, so we’ll see. He might not want any more.